The Holy Father yesterday reflected with the faithful upon the person of the Apostle Matthew in his Wednesday Audience. Obviously Matthew understood that familiarity with Jesus did not allow him to continue with activities disapproved by God. One can easily intuit that it can also be applied to the present: Today one cannot admit attachment to what is incompatible with the following of Jesus, as are dishonest riches. Once he said openly: "If you would be perfect, go, sell what you possess and give to the poor, and you will have treasure in heaven; and come, follow me" (Matthew 19:21). The example of this tax collector, this "gift of God," remind us that "Jesus excludes no one from his friendship" and that "The good proclamation of the Gospel consists precisely in this, in the offering of God's grace to the sinner!" Even so, there is another lesson we learn from Matthew, said the Pontiff: "He who seems to be farthest from holiness might well become a model of acceptance of God's mercy enabling one to glimpse its marvelous effects in his life." May the great Apostle watch over my nephew who bears his name! That's not so strange, is it? The Effingham Daily News last night ran an Associated Press story headlined, "Teacher's gender affects how girls and boys perform in classroom." For all the differences between the sexes, here's one that might stir up debate in the teacher's lounge: Boys learn more from men and girls learn more from women. This is the claim of new study published yesterday by Thomas Dee of Swarthmore College and Standford University. Frankly, I don't find this at all surprising. ...with a female teacher, boys were more likely to be seen as disruptive. Girls were less likely to be considered inatentive or disorderly. Again, I'm not at all surprised here. From my own brief experience teaching - all of one year - this already seems quite evident to me. This study should not cause controversy but cause us to ask the further question, "Why?" I have no real answers, but I do know the study's findings to be real, and this is no bad thing. When I retrieved my mail this morning I was rather surprised to find a small package. I have absolutely no idea who sent it to me or for what reason. There is a return address listed from a company of which I have never heard. Rather than keep you in suspense any longer, the package contained simply a small book: The Second One Thousand Years: The People who Defined a Millenium, edited by Richard John Neuhaus. If anyone has any idea why the book was sent to me - it is a pleasant surprise - I should be delighted to know. As you can see, I have finally received a couple of pictures of me riding on Blue (the horse) when we went canoeing a few weeks back. There can be no doubt that Blue was an easy horse to ride, even if he would only do what he wanted and when he wanted. I very much enjoyed and hope to hop on a horse again soon. Oh, the days when horses were the way to travel. Onward, to the past! Peter says to Jesus today, “We have come to believe and are convinced that you are the Holy One of God” (John 6:68). What does it mean to believe? What does it mean to have faith? The author of the Epistle to the Hebrews reminds us that faith is “the realization of what is hoped for and evidence of things not seen” (Hebrews 11:1). Furthermore, he tells us that without faith “it is impossible to please him, for anyone who approaches God must believe that he exists and that he rewards those who seek him” (Hebrews 11:6). We know that faith is a gift from God and it is a gift that he freely and readily gives to everyone who asks for this gift. But receiving the gift of faith we must also assent to it, we must choose also to be believe, we must act upon it. Some believe because of an inner impulse, some because of what they hear, some because of what they see. Some people believe everything they hear or read and others believe very little of what they hear or read. Faith, believing, is not always easy as we know so well. Many who had followed Jesus for some time and thought him to be the Messiah said, “This saying is hard; who can accept it?” and they left Jesus, turning to some other teacher or belief – turning, perhaps, to the equivalent of Oprah or Dr. Phil who really are no different than each of us - as they looked for the one who would solve all of their problems and answer all of their questions (John 6:60). They sought a practical guide, not a relationship of love. Just as the living Father sent me and I have life because of the Father, so also the one who feeds on me will have life because of me. This is the bread that came down from heaven. Unlike your ancestors who ate and still died, whoever eats this bread will live forever (John 6:57-58). Jesus speaks with concrete images when the people first object to him because he said, “I am the bread of life; whoever comes to me will never hunger, and whoever believes in me will never thirst” (John 6:35). He answers their murmuring and their arguments even more concretely, saying, “the bread that I will give is my flesh for the life of the world” (John 6:51). Jesus does not back down. is in no way being symbolic. Jesus means what he says. He himself is “the way and the truth and the life” and because he is the Truth he will not and cannot lie to us, he will not and cannot deceive us (John 14:6). What he speaks is truth and he speaks it to us that we might embrace it with faith. Believing Jesus’ words is not always easy for us. Like Jacob, we wrestle with the Lord (cf. Genesis 32:23-33). Like Job, we argue with him and demand answers (cf. Job 31). We yell, we argue, we question, but in the end we, like Jacob and like Job, must yield to him who is love itself. Woke him and said to him, “Teacher, do you not care that we are perishing?” He woke up, rebuked the wind, and said to the sea, “Quiet! Be still!” Then he asked them, “Why are you terrified? Do you not yet have faith?” (Mark 4:38-40). The Apostles saw Jesus heal Peter’s mother-in-law; they saw him heal the paralyzed man and the man possessed by a demon; they heard the words he spoke and still they did not have faith at all times. But in the end they were faithful to the Lord, they followed him and trusted him, always begging him, “Increase our faith” (Luke 17:5). When we, too, say, “This saying is hard; who can accept it?”, Jesus turns his gaze toward us. He looks us lovingly in the eyes and, with great sadness in his heart, he asks us, “Do you also want to leave?” (John 6:67). Peter answers him with the answer that each of us should give him: “Master, to whom shall we go? You have the words of eternal life. We have come to believe and are convinced that you are the Holy One of God” (John 6:68-70). Thus, Peter’s boat because Jesus’ chair. When he had ceased speaking, he said to Simon, “Put out into the deep and let down your nets for a catch.” And Simon answered, “Master, we toiled all night and took nothing! But at your word I will let down the nets” (Luke 5:10). Jesus, who was a carpenter, was not a fishing expert and, yet, Simon the fisherman trusted this Rabbi, who gave him no answers but called on him to have faith (Pope Benedict XVI, General Audience, 17 May 2006). was already faith, open to a greater reality – open above all because it was not faith in something, but faith in Someone: in him, Christ. Thus our faith is also an initial faith and we must still journey a long way. However, it is essential that it be an open faith that lets itself be guided by Jesus, because not only does he know the way, but he is the way (Pope Benedict XVI, General Audience, 24 May 2006). Each day we journey ever onward on this great pilgrimage of faith, as we journey with and toward the Lord. “The school of faith is not a triumphal march, but a journey strewn with sufferings and love, trials and faithfulness to be renewed every day” (Pope Benedict XVI, General Audience, 24 May 2006). Jesus does indeed care that we are perishing; he feeds us with his Body and Blood to give us life and without this bread from heaven “the journey will be too long for” us (I Kings 19:7). To Sister Glenda Becker, S.S.N.D, daughter of Saint Anthony of Padua Parish, Effingham, Illinois, the Reverend Monsignor Leo J. Enlow, V.F., Pastor and Dean of the Effingham Deanery, and the Reverend Daren J. Zehnle, Parochial Vicar, on the occasion of her first profession as a School Sister of Notre Dame: Greetings of peace and joy! 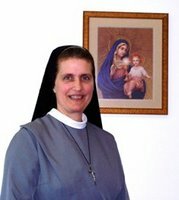 With great joy do we happily send this letter to you through the faithful hands of Sr. M. Cordula Wekenburg, S.S.N.D. Let her presence with you on the twenty-sixth day of August call to mind not only the unity of the School Sisters of Notre Dame but also the prayerful presence of the parishioners of Saint Anthony of Padua Parish. Since 1874 the spiritual daughters of the Blessed Mary Theresa of Jesus have generously and faithfully served the members of this parish, teaching and handing on the faith to countless children and adults. How happy we are that their dedicated example of humble love has led you to follow after them as you seek to the follow the Lord Jesus Christ. Today our hearts well up with praise and thanksgiving to Almighty God as you make your first profession and enter into the consecrated life. Many prayers will be raised to the Most High on your behalf in the coming weeks and the Holy Mass will be offered for you. May the Lord fill you with every joy and blessing! Given this twenty-fifth day of August, the Memorial of King Saint Louis IX, in the year of our Lord two thousand and six, at Effingham, Illinois. This was a lot of fun to write! Congratulations, Sr. Glenda! 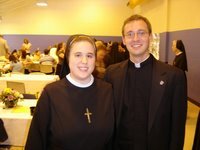 Or, rather, look who I found: Sr. Eva-Maria, F.S.G.M., the Blogging Nun. Sister is a member of the Sisters of St. Francis of the Martyr St. George. Last year we had the pleasure of meeting and sharing a bus ride to the episcopal ordination of the Most Rev. Kevin W. Vann - a priest of the Diocese of Springfield in Illinois - as the Bishop of Fort Worth, Texas. I quite accidentally stumbled upon her blog only yesterday. Take a moment and check out her blog, Starting Afresh from Christ. I think you'll really enjoy it; I know I have. Also, while you're thinking about it, say a prayer for the good Sisters throughout the world and for those young men considering the consecrated life. Yesterday, His Holiness resumed his Wednesday Catecheses on the Church, continuing his look at the Twelve Apostles. The Holy Father resumed his reflections on the person of the Apostle John, author of the Gospel and Letters of the same name and the Book of Revelation. Pope Benedixt reminded the faithful that the Book of Revelation "must be understood in the context of the dramatic experience of the seven Churches of Asia ... which toward the end of the first century had to face great difficulties - persecutions and even internal difficulties - in their witnessing to Christ." John's objective, he said, "is to unveil, from the death resurrection of Christ, the meaning of human history... With this, John wants to tell us two things above all: The first is that Jesus, though he was killed with an act of violence, instead of lying fallen on the ground remains paradoxically standing firmly on his feet, because with the resurrection he has vanquished death definitively. The second is that Jesus himself, precisely because he died and resurrected, now participates fully in the royal and salvific power of the Father. This is the fundamental vision." In reading the Book of Revelation, "we are before the typical Christian paradox," said the Holy Father, "according to which, suffering is never perceived as the last word; rather it is seen as a passing moment to happiness and, what is more, the latter is already mysteriously permeated with the joy that springs from hope." With stirring words, the Bishop of Rome suggested that the Apostle encourages us, saying, "Have confidence in Jesus, do not be afraid of opposing powers, of persecution! The wounded and dead Lamb conquers! Follow Jesus, the Lamb, trust Jesus, follow his way! Even if in this world he seems to be the weak Lamb, he is the victor!" Not forgetting the difficult situation of today's Christians, among others, in the Middle East, the Pontiff concluding his address praying with the Apostle: "Come, Jesus! Come and transform the world! Come now, today, and may peace conquer!" Amen. In reading the Holy Father's General Audience address which he gave yesterday I now realize that I seem to have missed one of his weekly addresses. Yesterday Pope Benedict said that he has spoken twice now about the Apostle John; regretfully, I only have the English translation of one such instance: 5 July 2006. Does anyone know when he spoke about St. John another time? Even better, can anyone provide me with an English translation? Many thanks! L'Osservatore Romano, the-semi official Vatican newspaper to which everyone ought to subscribe for the pictures alone, has launched a new web site for its photographs. The site looks as though it is updated each day with some fantastic shots of the activities of the Holy Father. Photographs may also be purchased through the web site. Oh, and for those who like to "borrow" desk top backgrounds from the web, you can do it here but the photo will have a copyright message running through it. 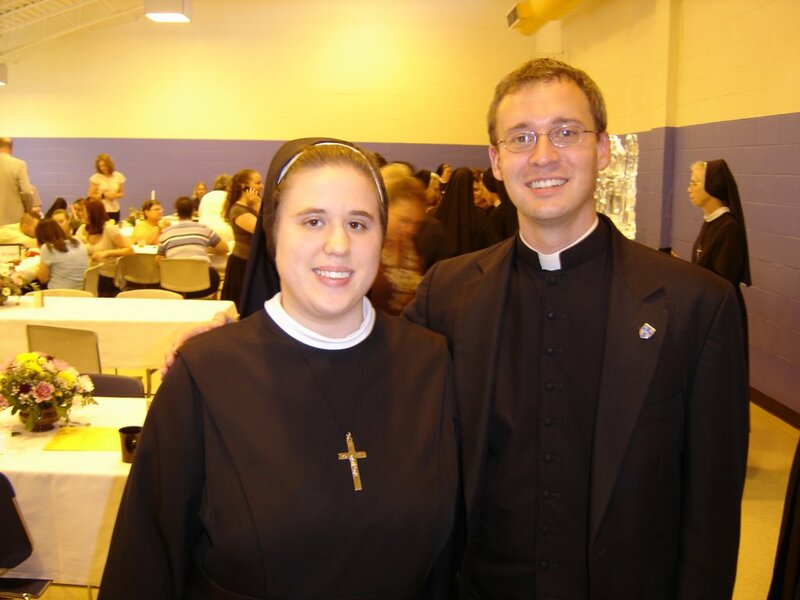 The Sisters of St. Francis of the Martyr St. George have posted pictures of their Profession Day last week. It you look carefully you can find me in a couple of them. How helpful were the textbooks? We had textbooks? Ha ha, just kidding, but I never used them. Not very; hardly read them. Not very. I understood what you wrote on the board better. Hardly ever used them . . . ever. Um, honestly they were good for holding my papers . . . that’s about it, though. Did the instructor present the material in an understandable fashion? When you spoke, yes, but sometimes the way you wrote on the board made it confusing (all the arrows and abbreviations). When I was studying it later I forgot what the arrows meant. Understandable? Yes. Interesting? Not so much. Was the instructor fair in grading? Yup. I like all the chances for extra credit, which by the way, this should be. I mean, I just got done taking your 9 page exam and you make me write more . . . Yes, it was my favorite. Yes, we had fun and still learned a great amount. Yes, it was fun but still educational. I wish you would teach Seniors. Did you learn in this class? Way more than other classes. YES!!! I’m glad I had this class. It cleared up a bunch of questions. I didn’t just learn Religion, either. I learned a few things about History. Not really, but I didn’t try. Would you recommend this instructor to others? Yes. I think you should teach Confirmation classes for the 8th grade. Well I did because I told them the class was fun when you weren’t trying to teach. What can the instructor do to make this class more enjoyable? Going to the gym more. It’s religion – it’s not supposed to be enjoyable. Well, get the class under control, especially the girls on the side of the room closest to the teacher’s desk. Throw erasers. Ha ha. Nothing really . . . religion just isn’t exciting. Not give us worksheets on our free days. Request to not have Mrs. N. as a sub! Movies, games, random study halls. Do more class exercises to get the class more involved. I think it is fine; it’s school – not necessarily supposed to be enjoyable. If you wanted it to be more enjoyable, I would show more movies, though. Um, more movies, less talk, just a suggestion. Be more like a teacher and try not to make or have a personal connection with everyone in the class. Most teachers here don’t really like the students. Fireworks. Or less learning. You handing out detentions would be funnier. You always threatened but never actually did. Play more games to study the material. What can the instructor do to help students learn better? Read along in the book or something. Don’t give in to students. Slow down a little when you talk and repeat what they should take as a note. Give out detentions and yell. I know if you would I probably would’ve gotten one but at least it would’ve entertained others. Give the students more to do; get them more involved and put more up to them. Notes that don’t go all over the board, have planned notes to write in orderly fashion; we like to be spoon fed our notes. Don’t ask, “Why?”, just give us the info. So very often I hear it said today, “I don’t get anything out of Mass”. “Father’s homilies are boring”. Sometimes I even hear it said, “Father’s homilies are too long”. This second and third statement may well be true, but the first certainly is not and it brings me great pain whenever I hear it. Look to him that you may be radiant with joy (Psalm 34:2-4, 6). To say, “I get nothing out of Mass”, shows a self-centeredness and a deep lack of understanding of the Mass. We do not come for ourselves; rather, we come to praise, worship, thank and adore the Living God who fills us with all good things. We should come, as Saint Paul says, “singing and playing to the Lord in [our] hearts, giving thanks always and for everything in the name of our Lord Jesus Christ to God the Father” (Ephesians 5:1-20). When to the Mass properly prepared and disposed God continues his work for us and leads us closer to salvation if we open our hearts to him. In this is shown to us the goodness and generosity of the Lord. We come to worship him and he in turn feeds us with the Body and Blood of his Son and pours out his Holy Spirit into our hearts. When we come to praise and adore the Blessed Trinity, we are drawn into the very life of the Trinity; we are drawn into the love that is God. To say, “I don’t get anything out of the Mass” is really to say, “I am not really here. I am sitting here, yes, but I am not allowing the Lord to speak within the depths of my heart.” It is to say, “I will not listen to the voice of the Lord; I will not recognize his Real Presence in the Sacrament of the Altar.” Saint Paul warns us today, “Watch carefully how you live, not as foolish persons but as wise, making the most of the opportunity” (Ephesians 5:15-16). Those who are wise come to the Mass receptive to the voice of the Lord. Let whomever is simple turn in here … Come, eat of my food, and drink of the wine I have mixed (Proverbs 9:4-5). Whoever eats my flesh and drinks my blood has eternal life, and I will raise him on the last day. For my flesh is true food, and my blood true drink. Whoever eats my flesh and drinks my blood remains in me and I in him” (John 6:54-56). When we eat his body and drink his blood we become one with him and he gives us a share in his eternal life and glory. How can one say, “I don’t get anything out of Mass.” He teaches us throughout the Liturgy of the Word and he feeds us with his very own Body and Blood in the Liturgy of the Eucharist; he unites us to himself. For what more could we possibly ask? Whoever, therefore, eats the bread or drinks the cup of the Lord in an unworthy manner will be guilty of profaning the body and blood of the Lord. Let a man examine himself, and so eat of the bread and drink of the cup. For any one who eats and drinks without discerning the body eats and drinks judgment upon himself (I Corinthians 11:27-29). This is why the Church still insists that all mortal sins must be confessed before one receives Holy Communion. This is why we must prepare ourselves spiritually and physically to receive Holy Communion. We must open our hearts to receive this great gift of love and we must fast for one hour before receiving the Eucharist as a sign of our devotion. In addition to this, we ought to pay attention to the way that we are dressed when we come to the Mass, when we come into the presence of the great King of heaven and earth. More often than not, a failure to dress more appropriately for the Lord comes from a certain laziness, and laziness always demonstrates a lack of love. We need not dressed in tuxedos or formal gowns – although there is nothing wrong with this – but we also should not come in clothes that we might also wear to bed. To dress in one’s “Sunday best” is a fitting and proper way to show our respect for and love of the Lord Jesus Christ who gives himself totally to us. He Who gives Himself totally to you may receive you totally (Saint Francis of Assisi, Letter to the Entire Order 26-29). As I walked from the rectory to the high school last night for a volleyball scrimmage I found myself reflecting on suffering and the love we come to experience through suffering. We share our sufferings and difficulties with those with love, that is, with our close family and friends. We share our sufferings with our loved ones by talking with them about our trials, hurts and pains, much as we would share with our joys and happiness. Sometimes we seek their assistance and aid, sometimes we seek their advice, and sometimes we simply seek an understanding and listening ear. We share none of this with complete strangers or even friends with whom we are really more acquaintances. Is it any wonder then that the Christ desires to share his suffering with us? He does far more than simply describe his suffering to us, as we do with our friends. Jesus calls us friends and so he invites us to share fully in his sufferings by taking up the Cross and following after him, so that we might share also in his glory. Seen in this light it seems not so strange that we must suffer with him, for in this way he demonstrates his love quite clearly. How great is the love of God! Give us your grace to carry the Cross! The new academic year fast approaches and I feel far from ready for it! Fortunately, I will be teaching the same course this year as last: Religion IV, being two thousand years of Church history and all seven Sacraments. It is a daunting charge and one that I think is quite impossible. We shall get as far as we do. I spent last evening setting up the classroom and today there are faculty meetings at the high school. My class begins on Tuesday so I will be spending the weekend finishing up last minute preparations. All this being said, I am greatly looking forward to teaching again. On Wednesday I had 13 students in my class; on Friday I had 15; I'm curious to see how many I will have on Tuesday. On Tuesday, 15 August, the Solemnity of the Assumption of the Blessed Virgin Mary, the Sisters of St. Francis of the Martyr St. George in Alton, Illinois received six Novices just before six Novices took thir first profession and one sister celebrated her Golden Jubilee. At the invitation of Sr. M. Clementia, a friend from Great River Teens Encounter Christ, I served as the Master of Ceremonies for the celebration including seven Bishops, thirty-some priests, and I am not sure how many of the laity. It was a daunting task but the three sisters in the sacristy helped make everything go smoothly. Thanks, Sisters! Mother Regina Pacis must have been pleased with the day. After the Mass she invited me to celebrate Mass for the Sisters today at 11:30. I will be leavning shortly to be witht he sisters again and I am very much looking forward to it. 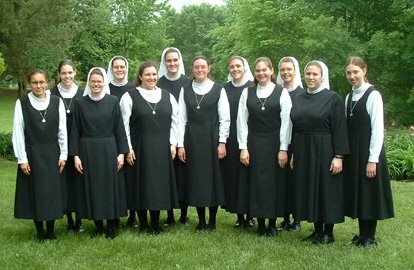 It brings great joy to my heart to see so many young sisters. May they be blessed with many more! 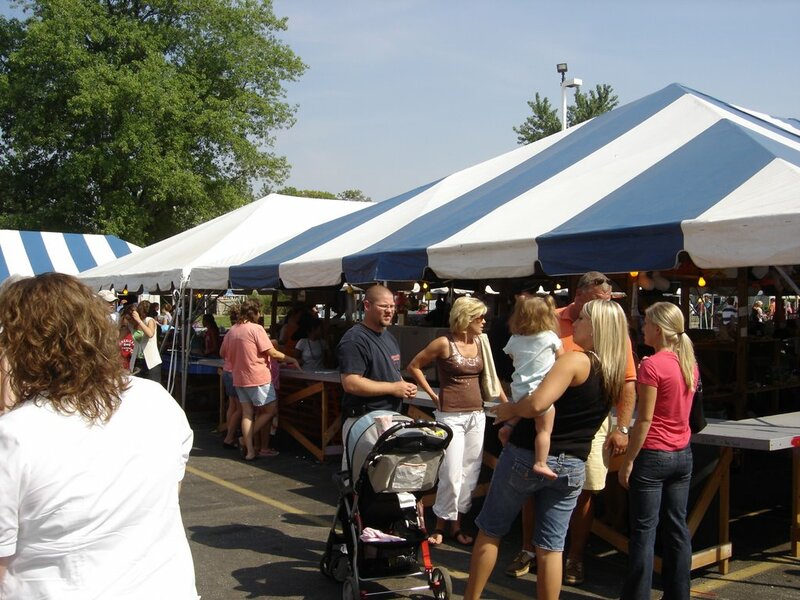 St. Anthony of Padua parish held its annual parish picnic this past weekend. Hundreds of people returned home for the festivities and a good time seems to have been had by all in attendance. I spent most of Satuday evening and Sunday at the picnic visiting with parishioners and making myself seen at all corners of the picnic (at least I think I did). That's always the trick with events like this. People expect the priest to be around but it's hard to be present for 4,000 parishioners. At any rate, I did what I could and enjoyed my time at the picnic. I'm looking forward already to next year's picnic. Some of you may recall that some weeks back I gave two days of presentations on the Scriptures and the Sacraments to a group of youth from across the Diocese at what we call Christian Leadership Institute: Advanced Catholic Training. Our Diocesan newspaper, The Catholic Times ran a story on ACT. The article makes mention that I spoke "at length" about the Sacraments. My family found that rather amusing as they always have said that I am always talking. the whole congregation of the people of Israel murmured against Moses and Aaron in the wilderness, and said to them, ‘Would that we had died in the land of Egypt, when we sat by the fleshpots and ate bread to the full; for you have brought us out into this wilderness to kill this whole assembly (Exodus 16:3). The people saw and experienced the mighty deeds of the Lord but they did not trust in his providential care for them. They had plenty of bread to eat in Egypt – despite their great sufferings there – but no bread they had in the desert. Hearing their grumblings and knowing their plight, the Lord said to Moses, “Behold, I will rain bread from heaven for you; and the people shall go out and gather a day’s portion every day, that I may prove them, whether they will walk in my law or not” (Exodus 16:4). The Lord would feed them till they were satisfied each day, but he would also test their faith through this manna from heaven. But what was this manna that rained down from heaven in the morning? The manna was “a flake-like thing, fine as hoarfrost on the ground” (Exodus 16:14); “it was like coriander seed, white, and the taste of it was like wafers made with honey” (Exodus 16:31). “The people of Israel ate the manna forty years, till they came to a habitable land” (Exodus 16:35). It was their bread for the journey. As the lembas bread for the elves of Tolkien’s middle earth, the manna was the way bread for the pilgrim Israelites, just as the Eucharist is our way bread, our bread for the journey, on our pilgrim way “to a habitable land,” the kingdom of heaven. Today Elijah begs for death because he feared the power of Jezebel after he killed 450 of the prophets of her false god. The Lord hears his cry and gives him food and drink and says to him, “Get up and eat, else the journey will be too long for you!” (I Kings 19:7). Elijah, “strengthened by that food,” journeyed then to the presence of God; so, too, do we (I Kings 19:8). I am the bread of life. Your ancestors ate manna in the desert, but they died; this is the bread that comes down from heaven so that one may it and not die. I am the living bread that came down from heaven; whoever eats this bread will live forever; and the bread that I will give is my flesh for the life of the world (John 6:48-51). Let us, then, “taste and see how good the LORD is,” he who gives himself to us so that we might live with him forever. The Most Holy Eucharist is, indeed, our bread for the journey, our way bread. It is, as Saint Ignatius of Antioch calls it, “the medicine of immortality and the antidote against death, enabling us to live for ever in Jesus Christ” (To the Ephesians 20). For those who receive it in faith and in love, the Body and Blood of the Lord is a safe passage through the perils of this world and a foretaste of the banquet of heaven. Nourished and sustained by the Eucharist, the Bread of Angels, the true manna from heaven, we journey ever onward toward the new and eternal Jerusalem, but we do not journey alone. Union with Christ is also union with all those to whom he gives himself. I cannot possess Christ just for myself; I can belong to him only in union with all those who have become, or who will become, his own. Communion draws me out of myself towards him and, thus, towards unity with all Christians. We become “one body”, completely joined in a single existence. Love of God and love of neighbor are now truly united: God incarnate draws us all to himself (Deus caritas est, 14). Such is the power of the love of God. may receive you totally (St. Francis of Assisi, Letter to the Entire Order, 26-29). 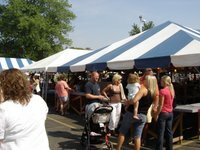 Every year during the second weekend of August St. Anthony of Padua Parish in Effingham holds it's parish picnic, an event that is quite the homecoming for the entire community. If you happen to be free the weekend of the picnic, I invite you to attend our festivities and help support our parish. Like the people of Effingham, I would be very happy to see old friends at the picnic. If you plan on attending, give me a call. 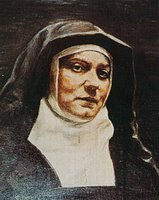 I have had the great joy of being present at the canonization of one saint, that of Teresa Benedicta of the Cross, Edith Stein, whose memorial we celebrate today. 11 October 1998 was a beautiful day in Rome and St. Peter's Square was packed for the Mass as Holy Mother Church raised this Carmelite nun to the dignity of the altars. Born a Jew, at the age of fourteen, "I consciously decided, of my own volition, to give up praying," she said. But one night she picked up the autobiography of St. Teresa of Avila and could not put it down. Upon completing it she said to herself, "This is the truth." Thus began her journey to Christ and her embrace of the Cross. She was killed in a gas chamber at Auschwitz today in 1942. "I thought that leading a religious life meant giving up all earthly things and having one's mind fixed on divine things only. Gradually, however, I learned that other things are expected of us in this world ... I even believe that the deeper someone is drawn to God, the more he has to 'get beyond himself' in this sense, that is, go into the world and carry divine life into it." "If anyone comes to me, I want to lead them to [Jesus]." "Human activities cannot help us, but only the suffering of Christ. It is my desire to share in it." "Henceforth, my only vocation is to love." "Ave Crux, spes mea! (I welcome you, Cross, our only hope!)" In the July/August issue of Lay Witness, the publication of Catholics United for the Faith, Emily Stimpson has an entertaining article entitled, "The Average Catholic's Guide to Becoming a Doctor of the Church." Ms. Stimpson rightly notes at the end of her article that "even if the Trinity doesn't come through on the whole Doctor thing, and even if the Church never adds you to the official list, pursuing wisdom and holiness still has other rewards." His summer vacation in Les Combes having ended, the Holy Father flew by helicopter on Wednesday from his summer residence of Castel Gandolfo to the Vatican for the general audience. Continuing - albeit briefly - his reflections on the Apostles he spoke especially to altar servers gathered in Rome. Young Joseph Ratzinger began serving at the altar of the Lord in 1935, "beginning a long journey on this road," he said. Commenting on the Apostles, Pope Benedict said that, "In a nutshell, we could say that they were the 'friends' of Jesus . . . They were, and they were able to be, apostles and witnesses of Christ because they were his friends, because they knew him on the basis of friendship, because they were close to him." With the heart of a pastor, the Holy Father said to the altar servers, "Today, seeing all of you here before me in St. Peter's Square, I think of the Apostles and I feel the voice of Jesus telling you: 'I no longer call you servants, but friends: remain in my love, and you will bear much fruit.' I invite you: listen to this voice! Christ didn't just say this 2,000 years ago; he is alive and he says this to you here and now. Listen to this voice with great openness; it has something to say to everyone. Maybe to some of you it says: 'I want to serve in a special way as a priest becoming his witness, him being my friend, and introducing others to this friendship.' Listen together with trust to the voice of Jesus." Although each person's vocation is different, Jesus calls all of us to be his friends, he said. Dear servers, in reality you are already apostles of Jesus! When you participate in the Liturgy offering your service at the altar, you offer to all a testimony. Your thoughtful attitude, your devotion to the parts of the heart and those expressed in liturgical motions, in singing, in the responses: if you do these in a proper way and not distractedly in whatever way, then yours is a testimony which touches others. The chain of friendship with Jesus has as its source and its summit in the Eucharist. You are very close to Jesus in the Eucharist, in the celebration of the Holy Mass and this is the greatest sign of his friendship for each of us. Do not forget this! And for this I ask: do not get used to this gift, sot hat if does not become a sort of habit, knowing how everything functions and doing it automatically, but discover it anew each day that something so great is happening, that the living God is in our midst, and that you may be ever more close and bring your contributions so that the mystery may be celebrated and reach the people. If you do not give in to the habit of it and develop your service from your interior selves, then you are truly his apostles and carry fruits of goodness and of service in each area of your life: in your family, at school, in your free time. This love that you receive in the Liturgy, carry it to all people, especially when you notice those who lack love, who do not receive goodness, those who suffer and are alone. With the strength of the Holy Spirit, seek to bring Jesus himself to those who are cast out, who are not loved very much, people who have problems. To these, with the strength of the Holy Spirit, you must bring Jesus. So that Bread, which you see broken on the altar, will be shared and multiplied farther. And so that you, like the twelve Apostles, may help Jesus to distribute the Bread of Life among the people of our time, in the diverse situations of life. They need this bread! So, dear servers, let my final words to you be these: always be friends and apostles of Jesus Christ! Thanks to Rocco Palmo for the translation! He also a couple of good pictures of Pope Benedict. Today’s celebration of the transfiguration should give us reason to pause and reconsider whom this Jesus is that we seek to follow. Just what is it that Jesus calls us to do? As the disciples come down the mountain with Jesus today they are confused, baffled and puzzled as to why the glory of Jesus no longer shone before. Having seen his glory the disciples could not understand what Jesus meant when he told them to keep this event quiet until he should rise from the dead. Indeed, Mark tells us that, as they descended the mountain, the disciples were still “questioning what rising from the dead meant” (Mark 9:10). The disciples did not understand this statement of Jesus because they did not yet understand that the Messiah must suffer and die and so enter into his glory. How often do we, too, misunderstand the mission of the Messiah as well? If we were with Peter, James and John on the mountain with the Lord standing there with Moses and Elijah I have a feeling that we would say with Peter, “Rabbi, it is good that we are here!” (Mark 9:5). How easy it would be for us to stay in the presence of the Lord to behold his glory, never having to work, never having to fear, never having to feel the pain of love, never having to embrace the Cross. Thrones were set up and the Ancient One took his throne. His clothing was bright as snow, and the hair on his head as white as wool. His throne was flames of fire, with wheels of burning fire. A surging stream of fire flowed out from where he sat; thousands upon thousands were ministering to him, and myriads upon myriads attended him (Daniel 7:9-10). You will recall that Jesus’ clothes, too, “became dazzling white, such as no fuller on earth could bleach them” (Mark 9:3). Upon Mount Tabor Peter, James and John were permitted a glimpse of Jesus’ true identity as the Son of God and the King of heaven and earth. As they beheld his brilliant radiance, they began to understand that this Jesus was more than they had previously imagined, his power and his glory far greater than they had expected. But why does the Ancient One sit upon a throne of fire? Fire has always represented holiness and purity and such a throne demonstrates the absolute holiness of God. In the vision of Isaiah and again in that of John, the angels standing around the throne of God cry out, “Holy, holy, holy is the LORD of hosts; the whole earth is full of his glory” (Isaiah 6:3) and “Holy, holy, holy is the Lord, almighty, who was and is and is to come!” (Revelation 4:8)). Three times do they cry “holy” to make known the superlative quality of God; there is nothing holier than God himself and because of this his face radiates with a tremendously bright light. So bright, in fact, that the six-winged seraphim – themselves made of fire – must shield their eyes in the presence of God. When Moses came down from the mountain after speaking with the Lord, he, too, had to veil his face when speaking with the people because his face now shone with the radiance of God, so great is the glory of God. This helps to explain, then, why “a cloud came, casting a shadow over them; [and] from the cloud came a voice, ‘This is my beloved Son. Listen to him.’” (Mark 9:7). Even these chosen three could only look upon the glory of the Lord for a short time. One like a Son of man coming, on the clouds of heaven; when he reached the Ancient One and was presented before him, the one like a Son of man received dominion, glory, and kingship; all peoples, nations, and languages serve him. His dominion is an everlasting dominion that shall not be taken away, his kingship shall not be destroyed (Daniel 7:13-14). For the Jews of Jesus’ day, the phrase “Son of man” was a code word of sorts for a divine figure. In Jesus Christ, the Son of man is the Son of God. But what is more, after the Father raised Jesus from the dead by the power of the Holy Spirit, and after Jesus breathed the Holy Spirit upon the Apostles, he ascended to the right hand of the Father upon the clouds, accompanied by the angels. Seated now at the right hand of the Father, Jesus is Christ the King who governs all things and who will return in glory to judge the living and the dead, whose dominion is everlasting. The Apostles immediately recognized the glory of Christ and his dominion in the transfiguration and so on the way down the mountain there is no need to question this, but they did not understand that Jesus must rise from the dead, for they did not understand that he must die and so they questioned what this meant. Pope Benedict XVI recently pointed out that Peter, James and John were each present at both the transfiguration and at the Garden of Gethsemane. Therefore, it is a question of two very different situations: In the one case, James, with the other two disciples, experiences the Lord’s glory, sees him speaking with Moses and Elijah, sees the divine splendor revealed in Jesus; in the other, he finds himself before suffering and humiliation; he sees with his own eyes how the Son of God humbles himself, becoming obedient unto death… [They] had to discern how the Messiah, awaited by the Jewish people as a victor, was in reality not only surrounded by honor and glory, but also by sufferings and weakness. The glory of Christ was realized precisely on the cross, in taking part in our sufferings (Wednesday Audience, 21 June 2006). The same is true for us. In the waters of baptism we died with Christ and rose with him to new life. The glory of Christ is realized in us precisely because we share in his Cross. Francis, with the advantage of hindsight, was able to understand what the Apostles were unable to grasp: that glory is revealed precisely in weakness and in suffering. This is the heart of the Paschal Mystery. 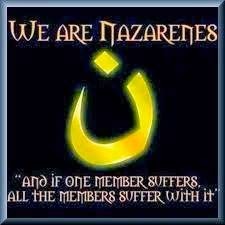 To this we are called. To many people today this acceptance of suffering seems rather absurd, foolish and maybe even stupid. But as St. Peter tells us today, “We did not follow cleverly devised myths when we made known to you the power and coming of our Lord Jesus Christ, but we had been eyewitnesses of his majesty” (II Peter 1:16). The glory of the Cross comes not from man but from God. It is a glory that the wisdom of this world cannot understand. Let us then embrace the Cross and realize that “The saying is sure: If we have died with him, we shall also live with him; if we endure, we shall also reign with him; if we deny him, he also will deny us; if we are faithless, he remains faithful – for he cannot deny himself” (II Timothy 2:11-13). This past Sunday through Tuesday I went canoeing and horseback riding with several friends with whom I have worked in youth ministry and some of the youth from their various parishes. This was the first time I went canoeing and the first time in more than a decade that I rode a horse, although I have ridden a few elephants and camels since that time. The trip was simply delightful, so much so that I hope to be able to do this every year now. We canoed for some eleven miles (maybe more) but I enjoyed nearly every minute of it. The next day, though, I discovered that the human body could in more places at the same time than I ever thought possible. It provided a good workout and helped tone up some muscles a bit and may inspire me to attempt to get in shape; probably not, but who knows! I have wanted to have a horse (and a falcon) since I was a kid and after spending about an hour and a half on a horse named Blue this desire remains. The horse was - as the guide promised - of a very similar personality as me. When we came to the first spot in the river to cross, Blue stopped on the shore, looked up and down stream, looked across to the other side, and finally decided to step into the water, almost as if to say, "I really don't want to do this." When we crossed the water a second time a large area of mud - several inches deep - awaited us on the other side. Blue stopped in the water, examined the mud and carefully picked his way through. At various spots the trail would split very briefly - maybe ten feet - with one path continuing straight along and another going slightly around a tree; Blue, with the exception of one, always took the straight and direct path. He only climbed the mountain we were on when he was good and ready and on the way down the mountain he decided he did not want to wind around with the trail but wanted to take the direct route through the woods (I was able to stop him in this one). Even with all of this, it was a blast! If you have not gone canoeing or horseback riding, I highly recommend it!